This symposium is offered to ALL youth, ages 16-30. However, the symposium targets Latino youth and is culturally sensitive to the unique Latino patient-care needs of Northern California. and giving integrity to each student’s unique health path. Workshops & activities promoting mental health wellness, mental health careers, and reducing barriers to college. Dynamic speakers introducing culturally competent healthcare & an empowering future. Interactive stations that enable hands-on activities introducing behavioral & primary medical fields. The Discovery Center of Exhibitors tabling resources: health education, access to health services, financial opportunities, internships, college programs specific to healthcare careers, answers to college barriers, and social services serving youth. ALL youth age 16-30 interested in a healthcare career. ALL youth desiring to be informed of mental health services & information. ESPECIALLY youth of minority descent, with an emphasis on Latino heritage. ESPECIALLY youth who are to become 1st generation college graduates. ESPECIALLY youth who are economically/educationally disadvantaged. 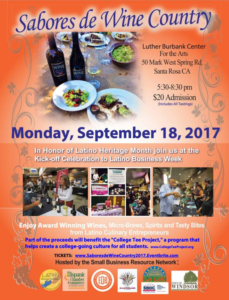 Latino Service Providers is proud to act as the fiscal sponsor for the newly created Small Business Resource Network (SBRN) now in its second year, which organizes the Sabores de Wine Country event and other promotion of Latino businesses. The SBRN is a newly formed group of non-profits and agencies that are working with Latino and other underserved small businesses in Sonoma County and it includes; Latino Service Providers(LSP), Community Action Partnership(CAP), CAFÉ Cloverdale, Hispanic Chamber of Commerce, Hispanic Chamber Young Professionals, North Bay Black Chamber of Commerce, Los Cien Latino Leaders, La Luz Center and the Small Business Development Center(SBDC). (Currently reaching out to the Filipino Association). The purpose of the Small Business Resource Network is to bring together the providers that are offering resources and services to minority and underserved small businesses and entrepreneurs. In coming together members share best practices and find ways to work together through collective impact to help small businesses grow and succeed. The ultimate goal is to help entrepreneurs start businesses, grow businesses and be successful. The more resources that are available to local entrepreneurs, the more likely they are to stay in Sonoma County and flourish, adding to the community’s economic wealth and quality of life. September 12th – held the third annual Sabores de Wine Country. Proceeds designated to the “College T” program. September 19th – held second annual Sabores de Wine Country. 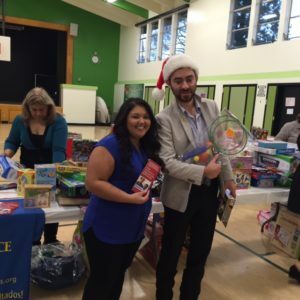 Proceeds went to Luther Burbank Elementary Schools third grade class. 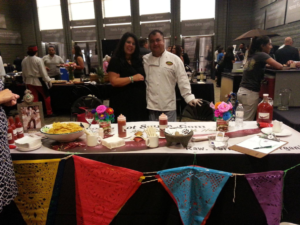 September 21, 2015 for Latino Business Week during Latino Heritage Month, SBRN conducted a Kick-Off to Latino Business week which was held on Monday September 21st , 2015 from 5:30pm – 8:30pm with “Sabores Latinos”. There were visits scheduled from each Sonoma County Supervisor, with 3 or more Latino businesses in their respective districts and they presented each business with a Latino Heritage Month certificate of appreciation. Sabores de Wine Country brought together Small Business Owners and Community members to celebrate Latino Business in Sonoma County. Attendees mingled with Small Business Owners, connected with Small Business resources and enjoy libations and tasty bites from Sonoma County Latino culinary entrepreneurs. The location for this event was at the Luther Burbank Center for Performing Arts, formally known as “Wells Fargo Center for the Arts”. There was a short program during the event in which the Chair of the Board of Supervisors, Susan Gorin spoke to the impact that Latino businesses have on our local Sonoma County economy. The event also served as the launching pad for the Small Business Resource Network (SBRN). ‘Sabores Latinos’ will serve as a platform for small businesses, many of them start-ups that are graduates of Community Action Partnership’s ‘Micro Business Development Program’. This event will help promote their businesses and at the same time recognize the impacts that Latino entrepreneurship has on our economy. By helping Latino entrepreneurs have access to resources and programs that will help their businesses thrive, we build a healthier community, strengthening Latino families throughout Sonoma County. The event layout included 40 booths with 20 to 25 of those booths being occupied by a mix of catering companies, restaurants, wineries and breweries offering tasty bites of delicious Latino cuisine. The other ten to fifteen booths were occupied by non-profits and agencies that offered resources and programs to small businesses. Proceeds after expenses (50% of net) wend to the Valley fire victims fund (Lake/Mendocinco County). The Día de los Muertos provides a community space for people to honor, remember, and celebrate loved ones who have crossed over. 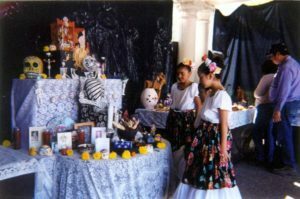 The Dia de los Muertos event assists participants in making a connection with ancestral knowledge by discussing openly those family members who have passed, “Knowing who we are and where we come from is crucial to the development of self- identity and self-love”. celebrating loved ones who have crossed over. Students and community members from all around Sonoma County participate in this event annually. Many of the participants are Latino and indigenous students. It is a family cultural and educational event. Santa Rosa Día de los Muertos is “remembering and celebrating” loved ones who have crossed over. Community members and students are invited to bring pictures or mementos of loved ones who have died. 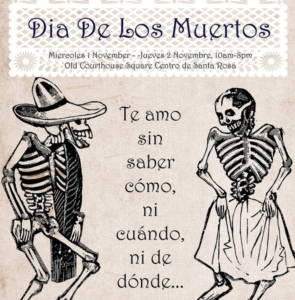 Be prepared to make frames and create personal altars by bringing some of your favorite things as you are invited to participate in an interactive educational experience commemorating the Día de los Muertos designed to engage students and community members in the learning process. It is a wonderful opportunity for children to ask their parents about great-grandparents, grandparents, uncles and other family and friends. It helps them to make a connection with ancestral knowledge. Knowing who we are and where we come from is crucial to the development of self- identity and self-love. Activities in the past, these have included cultural music, dance, art, poetry, arts and crafts, educational speakers, food, and more. 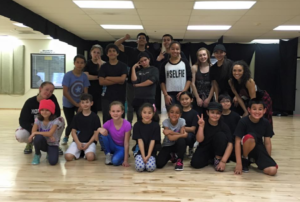 Sonoma County Dancers United (SCDU) is a local youth-founded organization with non-profit status provided by Latino Service Providers. SCDU was founded by Rachel Evans, a dancer and first year college student. They work with local dance studios, schools, and organizations to promote dance and provide free dance opportunities for children and teens in Sonoma County. SCDU believes everyone should have the opportunity to dance. Their programs help introduce youth to dance in a professional setting, sparking their interest in the performing arts and providing opportunities to try different dance styles, including cultural dancing. As dance inspires creativity, promotes lifetime physical fitness values, and builds self-esteem, participants have the opportunity to be exposed to these benefits. The programs provide opportunities for youth to engage in positive interaction and socialization, as well as opportunities for their families to support them at dance performances. All classes and events are posted on the SCDU Facebook page, and flyers in English and Spanish are shared with schools, several service provider organizations, and outreach workers. Participants are asked to register for classes within the age range posted for each class, as the dance choreography targets that particular age group. An effort is made to provide classes for all children and teens between the ages of 5-18 and there is an emphasis on reaching out to those who may otherwise not be able to access the performing arts in a professional setting. SCDU raises funds through fundraisers, sponsors, and grants to provide the free dance classes and dance studio scholarships for dancers who demonstrate an interest and commitment to dance. Since inception in 2014, SCDU has provided 35 dance classes for Sonoma County youths with the average class size of fifteen participants, and has also provided ten dance studio scholarships. Latino Service Providers is a nonprofit 501c3 that provides the nonprofit status for SCDU. 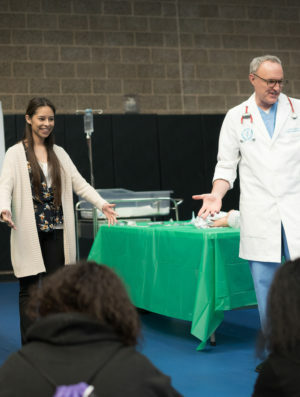 The Asian & Pacific Islander Health Forum is Northern California’s annual health education forum focusing on the Asian and Pacific Islander communities. Our goals are to inform professionals about the most relevant health challenges facing the Asian & Pacific Islander population in Sonoma County, to enhance access and quality of health services for the Asian & Pacific Islander community, and to facilitate networking among healthcare and other service providers. The Asian & Pacific Islander (API) population is increasing rapidly. This group represents a good percentage of Santa Rosa Community Health’s patient base. Every day it becomes clearer the necessity of understanding this population group’s cultural values as well as their immigration history and social life. Each year, a colloquium of speakers, residents, faculty and leaders of the community come together to address the specific needs of this diverse group. Every January 6 in Latin American countries, instead of Christmas day children receive their gifts from “Los Reyes Magos”. The tradition is that the Three Wise Men give gifts to all the children who have been good throughout the year. Our event honors this traditional holiday celebration with Mexican hot chocolate and “Rosca de Reyes” (an oval sweetbread decorated with candied fruit). All the children receive their piece of bread, hot chocolate and a toy. 2,000 toys are distributed to low- income children living in the west county area, primarily, but not limited to the Roseland area. 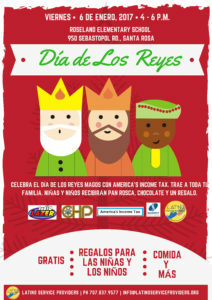 The Dia de Los Reyes has been organized by: Americas Income Tax, Radio Lazer, Radio la Mejor, in conjunction with the CHP and Latino Service Providers who serves as the events fiscal sponsor. Latino Service Providers, a nonprofit 501c3 nonprofit organization, serves as the fiscal sponsor for this event so your gift is a tax deductible contribution. ID #94-227740.